This exercise works defensive transition and attacking transition. The numbers are 8 blue, 8 black/orange and 1 red neutral player – the neutral always helps the team in possession. The game starts with blue and the neutral red playing 9v4 2 touch in the blue teams half of the field. Black/orange team send 4 players to pressure and win the ball. 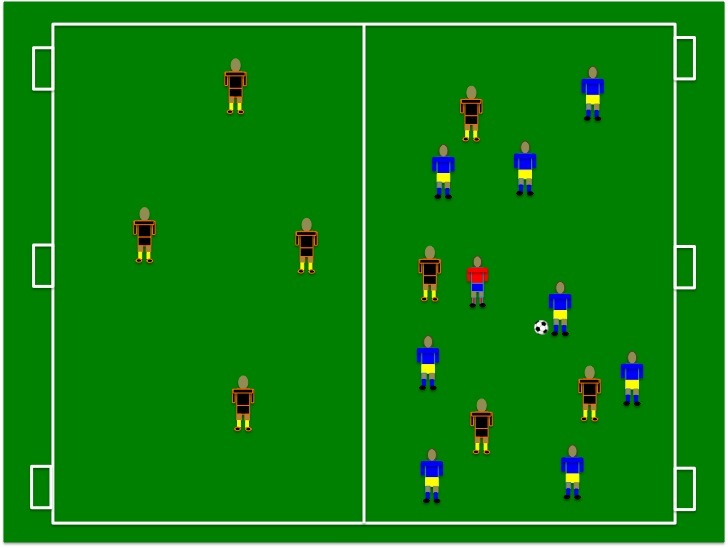 If black/orange intercept the ball they immediately try and play into their half (4 black/orange players already in their half and other 4 and neutral are running to help). If they complete 3 passes they can score on any of the 3 goals on in their half. After scoring they keep possession of the ball. The blue team upon losing the ball will send 4 defenders as quickly as they can, trying to stop the black/orange team from completing 3 passes and scoring. If the blue team intercept they will try and play to their half and make 3 passes and score before the black/orange team can stop them. This game is fast and furious. It demands a high intensity level, focus, discipline and quick play. The defensive group must pressure the ball immediately and take up good covering positions for each other. Quick transition in this game is essential.